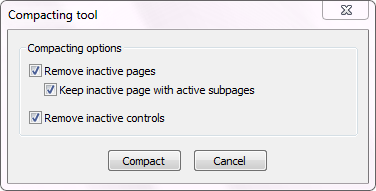 The project compacting will compress your project by removing all inactive elements at once: pages, topics, controls. In the settings dialog you may specify what kind of inactive elements must be removed from the project. On a large projects this will significantly increase the performance of your work and will save disk space.